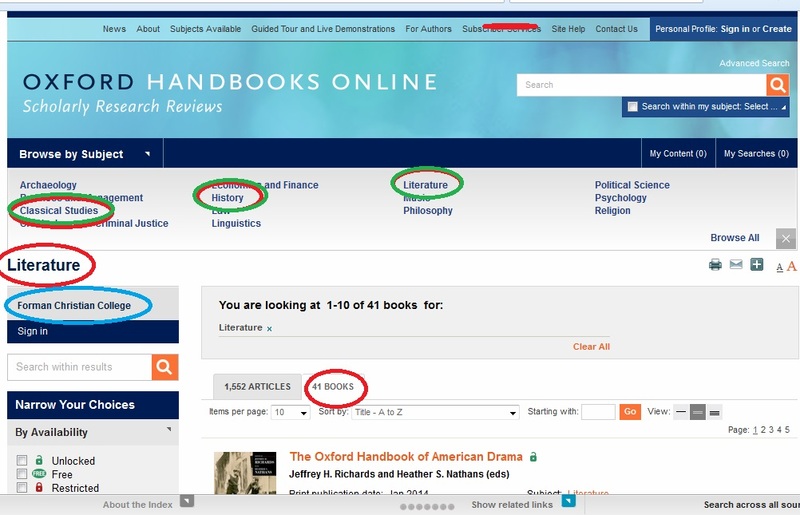 Oxford Handbooks Online (OHO), the home of scholarly research reviews, is an outstanding collection of the best Handbooks in 14 subject areas. The Ewing Memorial Library has received access to this valuable E-collection, through AMICAL Consortium as part of its 2013-2015 grant from the Mellon Foundation for purchasing electronic books in humanities disciplines to support the liberal arts at AMICAL institutions . Thanks you AMICAL! 86 E-Books from Oxford Handbooks Online in 3 packages; Literature, Classical Studies and History are now available online for FCC faculty and students. 2. Please check Forman Christian College as in the blue circle in the following picture, in the column on the left. 3. A list of Handbook Title opens – click on any title to open the Handbook and read Online! 4. A click on the “Articles” tab next to “Books” tab will open a list of articles in the books in a subject area. 1. Click on the link Oxford Handbooks Online to open the following website on any computer in FCC campus. 3. In the search results please notice the Green Lock Icon Open next to the articles for your access and download permissions. 4. If the lock icon next to the title is closed and in red color means absence of access rights.